Shrubs which form a continuous canopy are difficult to count – how could leaf biomass on a shrub canopy be measured? Normally, only the bark on tree boles is measured, but it would be useful to be able to estimate branch bark volumes – how might this be done? 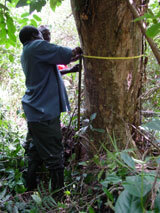 These lianas are difficult to locate and are loosly clumped in the forest – how can they be sampled efficiently? Counting fruit on large trees is time consuming and difficult – is it possible to efficiently sample within a tree crown? Objectively chosen sites do not seem to reflect the abundance or variety of mushrooms in the market – could the use of local knowledge improve on the representiveness of field monitoring data? What are the costs and benefits of optimising sampling for specific species over using a standardised design for all species? FOPW/03/4 Expert meeting for development on inventory techniques to assess non-wood forest product resources in African ACP countries, Lusaka, Zambia. 15-17 October 2001. FOPW/03/5 Réunion des experts des pays francophones d’Afrique sur le développement des techniques pour l’évaluation des produits forestiers non ligneux. Yaoundé, Cameroun. 15-17 Février 2002. FOPW/03/6 Summary of six case study reports as a contribution to development of practical techniques to assess non-wood forest product resources. The guidelines document which incorporates lessons from the case studies along with advice on the design of NWFP inventory is presently in the form of a first draft and is incomplete.